6724 Westchester Street | LEASED in West University Place, TX! 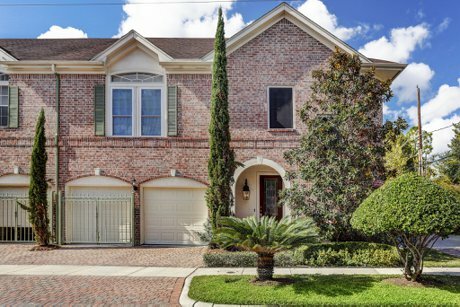 6724 Westchester Avenue is a well-maintained three bedroom, two and a half bath townhome located in West University's Westchester Court. This charming home has great features such as an open living room with a two-story ceiling, an elegant formal dining room, a dine-in island kitchen, elevator and more! Great natural lighting, neutral colors, crown moldings throughout. Powder room, elevator located near entry. Open living room with two-story ceiling, built-in TV wall mount, gaslog fireplace. Formal dining room shares the gas log fireplace with the living room. Built-in display shelves, coat closet, patio access. Spacious dine-in island kitchen. Double sinks, double electric oven, long counter-island with gas cooktop and breakfast bar, large pantry and stainless steel refrigerator. Flex room located off of the kitchen. Elevator opens to the large second floor landing overlooking the living room. Hardwoods, built-in desk. Utility area behind folding doors has space for a side-by-side washer and dryer with gas and electric washer hookups. Carpeted master bedroom suite with recessed ceiling. Master bathroom has a separate shower and jet tub, water closet, and large walk-in closet with an automatic light switch. Second and third bedrooms share a full bathroom with a single sink and tub/shower.